McCorquodales were the big industrial printers in Wolverton, and their story is described here, but there was a demand for printing on a smaller scale and the district has a history of such printing, beginning in the 19th century. Stony Stratford’s earliest printer of record was William Nixon, who had a press on the High Street, set up in the 1840s. He was also a stationer and bookseller and in 1857 he retired and sold the business to Alfred Walford. Newspaper publishing had been inhibited for many years by a government stamp duty. In 1815 the government imposed a 4d tax on every newspaper sold, which made them unaffordable for most. In 1836 the tax was lowered to 1d, and in 1855 was dropped altogether. “The penny dropped!” you could say. The time was right for Alfred Walford in 1857, who established a weekly newspaper called the Cottage Newspaper. It was later known as the Stony Stratford and Wolverton Station Advertiser. In 1868 it was became the North Bucks Advertiser. It may have been here that the young Oliver Ratcliff, who grew up in Stony Stratford, learned his trade, because he later set up his own press in Olney, The Cowper Press. The business was continued by Walford’s widow, Leah, and was taken over by George Eardley in 1902. Eardley also added a lending library to his range of services at 73 High Street.The newspaper closed down in 1909. It was most likely absorbed by another newspaper, but I am not sure which. It was not, at any rate, the Wolverton Express of the Buckingham Advertiser. The building was taken over by watts and beck who were bakers and confectioners. They also ran a temperance hotel for some years known as the Victoria Hotel. Hazeldine’s, the baker, operated here for many years in the mid 20th century. Wolverton’s first small scale printer, as far as I can tell, was Frederick Clarke, who opened his business at 30 Stratford Road c. 1910. A few years later he moved his premises to 11 The Square, underneath what is now the Masonic Hall. Subsequently he moved to a three storey house at 51 Church Street. His son carried on the business but it did not continue into the third generation as newer technology was making life difficult for small printing businesses. The business closed in 1960 and all the machinery was sold for scrap. The house was demolished to accommodate the Agora in the late 1970s. After WWII the newsagents, Muscutt & Tompkins, decided to expand into printing. 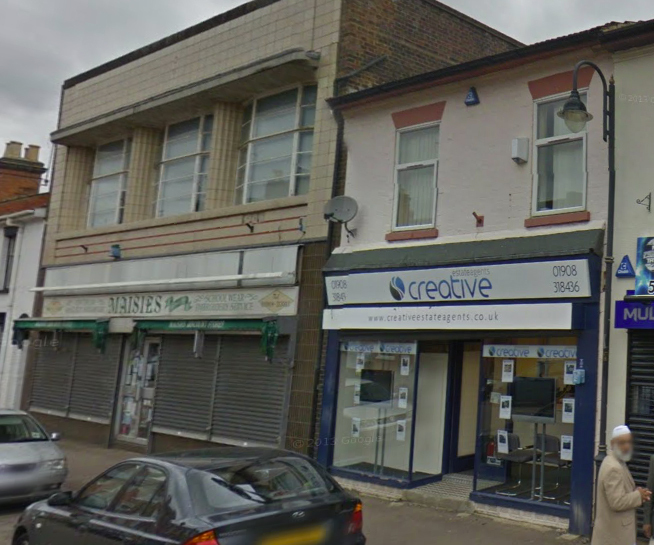 They acquired premises at 9 stratford Road with a stationery shop in the front and printing presses in the back. 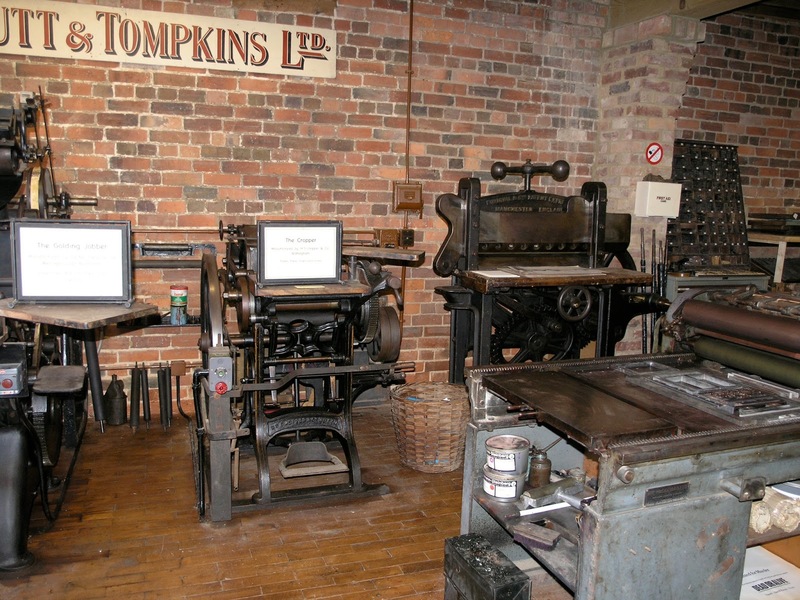 The printing press operation was managed and run by Reg Tomalin. 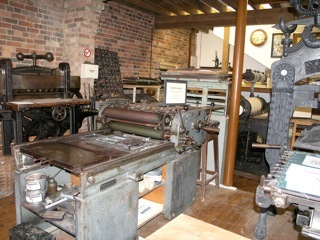 After that business closed, almost all the printing equipment was donated to the MK Museum which is now on display. The exhibition provides a very good illustration of printing technology in the pre-digital age. Printers now work with keyboards and computer monitors. Up to about 15 years ago machines like this were still in use. Printers would hand set their cast type into trays, lock them in place, ink the type with rollers and one-by-one print sheets of paper. 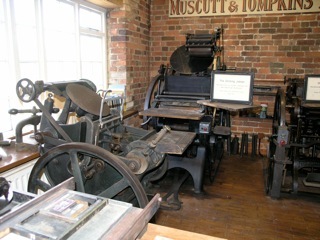 The machines on display at the MK Museum date in design from the late 19th century and the first half of the 20th century. In the top picture you can see an Albion Press – a 19th century press which had an improved mechanism over earlier flat bed presses. A single lever action could bring the paper into contact with the inked plate. The press in the second picture is a flat bed proofing press. It is a mid 20th century design. In this model the type can be laid on the flat bed and it can be inked and printed in a forward and backward pass. 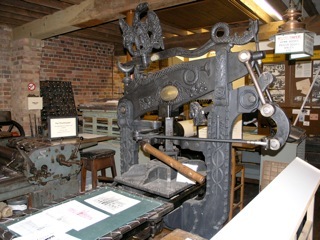 Printers often used this type of press for posters. The so-called platen press was activated by a foot treadle and flywheel and has a complicated mechanism for inserting the paper, inking the type, bring the paper on the platen into contact with the inked type, and removing the printed paper in a single cycle. By the mid 20th century these machines had become motorized, although theye were usually too expensive for the small jobbing printer. In that era, small “jobbing” printing was divided between Clarke’s on Church Street, Muscutt and Tompkins and Line’s at Newport Pagnell.Ron Bissell set up a small business in New Bramwell in the 1950s, starting with a hand-operated Adana press. Posters, particularly if colour was required, were often hand made in the 1950s. There was one chap I recall on Cambridge Street and another on Victoria Street providing this service. This was a bustling business at Number 5 Stratford Road. Newspapers were still, even in the 50s and 60s, important organs of communication and there was always a huge sale of daily morning papers, daily evening papers and weekly papers. Men and women would flood in on their way to work and after work for an evening paper, and, of course, cigarettes. It was the railways that made the growth of national newspapers possible. They were printed in Fleet Street at night, bundled to Euston in the early hours of the morning and loaded onto the slow train for delivery at each station. By 5:30 in the morning the papers, bundled with coarse string, were deposited outside Muscutt and Tompkins. A short time after this the unwrapping and sorting began. Newspapers were piled by title and then counted out for the paper rounds. Paper boys would arrive after 6, sort their papers and be off. In the 1950s the Daily Express and the Daily Mirror were the biggest selling titles. The Daily Mail, Daily Herald, Daily Sketch, News Chronicle and Daily Telegraph were in the middle, and The Times and Manchester Guardian sold very few copies. In those days the Times still had classified advertisements on the front page, so you could not tell what stories might be inside. It was also printed on better quality white paper. The Daily Herald used blacker, more greasy ink, and handling it always left your hands dirty. The News Chronicle disappeared in the mid-1950s, the Herald and Sketch later. The Manchester Guardian morphed into the Guardian and set up its printing and publishing in London. 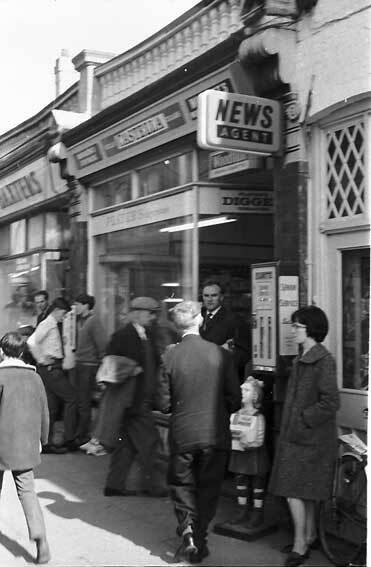 The Evening papers from London, the Evening Standard and Evening News sold moderately, but the big seller was the Northampton Chronicle and Echo. Muscutt and Tompkins had its foundations in the 19th century. Harry Cornelius Muscutt was a shoe maker turned news agent. He may have bought the business from a man called Robert Tilley who was operating there in 1883. Anyway, it was Muscutts by 1890. Bill Tompkins, who was very much a figure in Wolverton when I was young, married Ida Muscutt, one of Harry Muscutt’s daughters and thus the business became Muscutt and Tompkins. 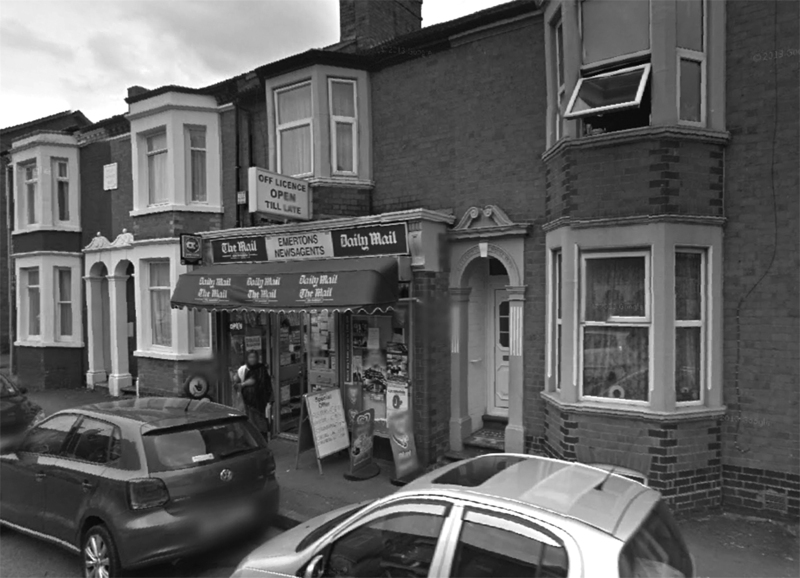 It certainly grew as a family business during the 20th century, holding at least three shops on the Stratford Road – a tobacconists at number 3, the newsagents at Number 5 and at Number 9 a stationery shop and printing business. According to the Office of National Statistics the average expenditure on tobacco was 6.1% of household income. In 2007 that relative figure was 1%. Tobacco sales were good business.